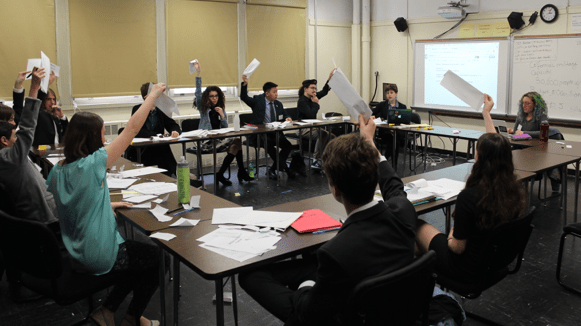 BHSEC Model United Nations hosted its inaugural extramural Model United Nations Conference (BHSECMUNC I) this past weekend on Saturday, May 20th. While BHSEC has previously held intramural conferences for members of the team, BHSECMUNC was open to any student inclined to participate in the full day affair of intense crises and negotiations. The delegates were split into two separate committees, the European Union and a Calexit simulation, although at one point, there was an attempted merger of the groups. The European Union discussed the ever important topic of the rise of right wing populism in Europe. Despite the somewhat small size of the committee, smaller than the expected 27 delegates by 20, the delegates were able to write several comprehensive working papers examining the issue from many different lenses. Delegates were able to use geographical perspectives, from the various countries they represented, as well as economic and social positions in order to gain a complete understanding of the complex topic. The Calexit committee was a simulation of the current California secession campaign. Started in late 2017, when President Donald Trump cut off all funding of UC Berkeley, the movement gained power in the 2018 midterm elections with the rise of the California National Party (CNP), a pro-secession party that pushed for a referendum to leave the United States. The CNP gained more influence as President Trump went through with his promise to deport all illegal immigrants, prompting massive raids by the Immigration and Customs Enforcement. Finally, a referendum was held, resulting in a narrow win for the leave side. Republicans of the United States, who held a majority of Congress, allowed California to got through with the secession, therefore taking out a Democratic stronghold in the electoral college. The simulation began on December first, 2019, with delegates taking roles of cabinet members of the new government, as well as representatives from different Californian political parties and Jared Kushner assuming the role of ambassador to the United States. Delegates receive updates from various sources, the favorite of which were mock Twitter accounts of CNN (@Calexit_CNN ‏), President Trump (@Calexit_Trump ‏), and the new Governor of California, Gavin Newsom (@GovOfCal). The delegates endured challenges ranging from a massive drought, to ISIS attacks on Disneyland, and a Kim Kardashian- Kanye West divorce. Near the end of the day, after the resolutions were passed and right wing populism had settled down, delegates of the EU decided to venture to the new nation of California, making an unprecedented offer of membership to a country outside of Europe. The deal was in part, an effort to make up for the economic loss after the United Kingdom left the EU in the 2016 Brexit referendum. “California can do more for us than Britain was ever able to do” said an anonymous EU official, “We hope they take the offer seriously and fully consider the benefits of joining the EU.” Unfortunately, in a 2020 referendum, Californians declined the offer in a devastating defeat with just 17% of voters opting to join the European Union. While BHSECMUNC I was smaller than originally hoped by organizers, the students in charge of the day took advantage of the smaller numbers to make sure each delegate was getting the full Model UN experience that hooks each delegate onto a life of international affairs. Look out for BHSECMUNC II coming to a school near you next May!